Including STRIVE in your estate plans is a meaningful way to demonstrate your commitment to providing young adults with disabilities with social, educational, and occupational opportunities. Bequests can be set up through a simple amendment to your will. Please keep in mind that tax laws and your own needs may change. You should always consult with your own attorney, accountant or advisors for the legal and tax implications before making a major charitable contribution. A charitable bequest to STRIVE can be a flexible and easy way to participate in supporting our cause. Bequests come in all sizes. For example, you may prefer that a bequest be for a specific amount, or, you could create a bequest that helps STRIVE after you have provided for your family and friends, called a residual bequest. All bequests are important to us regardless of size, and are gratefully received. Below is sample language for various kinds of bequests. Please remember to always consult your professional advisor when making or revising your will. Please specify if you want your bequest to be used for a specific purpose such as operations, staff, or a specific program or event. Specific amount, unrestricted purpose: These are especially valuable to STRIVE because they allow it to fulfill its highest priorities at the time your bequest arrives. I hereby give and bequeath to STRIVE (federal tax ID number 01-0473116), located at 28 Foden Road, South Portland, ME 04106, the amount of $______ to be used in the area of greatest need at the time the gift is received. Specific amount, restricted purpose: Restricted gifts can support important STRIVE initiatives such as education/wellness series, Camp STRIVE, afterschool programs, Tweens, STRIVE U, special events, or staff salaries. 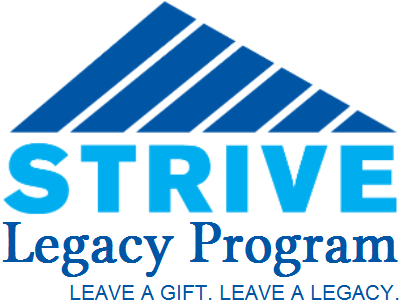 You can direct your bequest to support any program or operational aspect of STRIVE. I hereby give and bequeath to STRIVE (federal tax ID number 01-0473116), located at 28 Foden Road, South Portland, ME 04106, the amount of $______ to be used for its [programs, operations or general purposes]. Residual Bequest: A bequest of whatever remains after all other bequests have been made. I hereby give, devise and bequeath to STRIVE (federal tax ID number 01-0473116), located at 28 Foden Road, South Portland, ME 04106, my residuary estate (or ______% of my residuary estate) to be used for its [programs, operations or general purposes]. In the event that ________________________ is not living at the time of my death, or declines to accept the bequest I am making to him/her, I wish his/her bequest to pass to STRIVE (federal tax ID number 01-0473116), located at 28 Foden Road, South Portland, ME 04106, to be used for its [programs, operations or general purposes]. Usually, when people think of planned gifts, a bequest most often comes to mind. However, there are a variety of alternative opportunities that can help you make a bigger contribution than you may have thought possible. Some additional options include: Life Insurance Policies or Pension Plans (IRA, Other Retirement Plans, etc.) Either an old policy you no longer need, or a new one taken out especially for this purpose, might make a great gift. To make STRIVE the beneficiary of an existing life insurance policy or pension plan, you simply need to complete a change of beneficiary form. To give the insurance policy itself to STRIVE, ask for an assignment of ownership form from the insurance company and fill it out. Please let us know in advance of doing either. A new policy can be assigned to STRIVE after you make the first premium payment. I hereby designate STRIVE (federal tax ID number 01-0473116), located at 28 Foden Road, South Portland, ME 04106, as recipient of $_____ or _____% of the proceeds of my [insurance policy or retirement plan] to be used for its [programs, operations or general purposes]. For more information about planning a gift to STRIVE, please call or e-mail Betsy Morrison, Program Director, at bmorrison@pslservices.org or (207) 774-6278. If I include STRIVE in my will, whom do I need to tell about it? Once you complete your estate plan, please inform Betsy Morrison at STRIVE. We would like to thank you for your generosity by inviting you to join the [“LEGACY _____”], our honorary society for alumni, family, and friends who have included STRIVE in their estate planning. Your membership involves no dues, obligations or solicitations, but it does allow us to thank you and recognize you for the plans you have made, and it may inspire generosity in others. Can I accomplish more with a planned gift than an outright gift? Carefully planned gifts can allow some donors to make larger gifts to STRIVE than would otherwise be possible. Even though STRIVE will not be able to use these gifts immediately, as it would with outright gifts, planned gifts are critically important to our long-term financial strength and help ensure our ability to meet the opportunities and challenges the future will present us. Please consult the Planned Giving section of this site to review the various types of planned gifts you can make to STRIVE. Will I need a tax advisor when I set up a planned gift? Though STRIVE can help you set up your gift and recommend language, most estate-plan gifts will require the assistance of a professional financial advisor, tax advisor, or lawyer. How will I know my gift will be used as I intend? If I create a bequest or insurance policy gift, will you continue to ask me for annual contributions? Yes. It’s important to remember that both forms of giving address different needs - STRIVE’s long-term and immediate financial strength. As always, how and when you give to STRIVE is up to you and is greatly appreciated.